Wembley is a feminized Indica Marijuana strain, created by a cross between AK-47 and Bubble Gum. This strain is potent like a submachine gun with a sweet gum taste of tropical fruits. Wembley is a feminized indica dominant Marijuana strain created by a cross between AK-47 and Bubble Gum, two of the most respected strains. This unsual cross has led to a specimen that combines a deep and highly pleasurable high of AK-47 with the unmistakable and sweet bubblegum taste of tropical fruits. Wembley is a medium sized cannabis plant, well-branched and with light green, large, thick and resinous buds. The use of stakes or nets to support the branches are highly recommended. 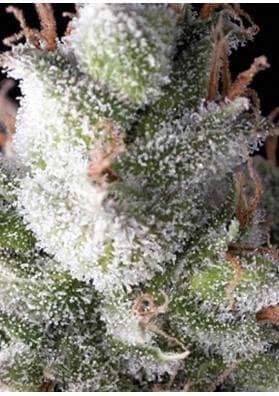 The pyramid-like buds that are produced are covered with hairs and a bright white layer harboring high concentrations of THC. In a growing room the plant will reach heights ranging from 75-150cm and after 55 and 60 days you collect productions ranging from 500-600 grams per square meter. In the outside, Wembley can reach heights ranging from 1 meter and 2.20 meters with great harvest that will definitely impress you: the best plant can offer you between a kilo and a half per plant, and the worst can offer you between 300 grams of weed. To be collected in late September.